The last two books from which I cooked for this blog offered the cook ways to sneak ingredients that are good for you into dishes that resemble comfort food or processed food. This booklet is the opposite: It gives you recipes that sneak mediocre processed foods into dishes that look like they might be good for you. Come & Eat is a booklet that Pillsbury publishes for distribution in supermarkets, or at least used to, with the appearance of a food magazine or mini-cookbook with quick recipes for “busy families” (which is marketing-speak for moms). Though actually, it’s a multi-page advertisement for processed food products from Pillsbury. An ad that you pay for. Only a couple of dollars, but still. I got this, what, nearly 10 years ago? Yet most of the products being touted are still familiar. Green Giant canned vegetables. Pillsbury refrigerated biscuits and rolls (the kind you pop out of a pressurized tube). Progresso soup. That sort of thing. The basic conceit is that you can use these processed foods to speed up your meal prep and make food that’s just as good as if you made it from scratch. This happens not to be true, but it’s an illusion that the big companies spend a lot of money to promote. This kind of thing is a linchpin of the Recipes of the Damned. 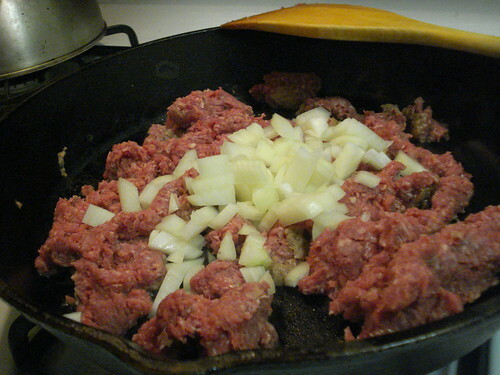 I have repeatedly railed about recipes that have you use tube biscuits instead of making your own (not difficult and immeasurably better), browning ground beef in salad dressing or using things like Velveeta. (Shudder.) But I have always assumed that the food would taste good — not great, but tasty in that comforting, guilty-pleasure sort of way. The booklet I have was published for the 1999 holiday season, so since it’s September I decided to rule out the more obviously Christmas-themed cookies and snacks. Well, I was sorely tempted by the Red-Nosed Reindeer Cake. 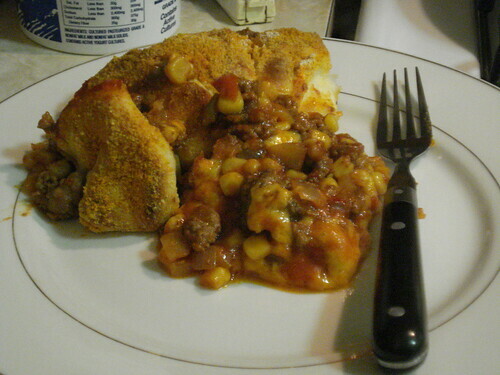 But I decided to pick something that would make for a quick weeknight supper, and settled on Biscuit-Topped Fiesta Supper because it called for the most brand-named ingredients. The recipe itself is fairly easy. 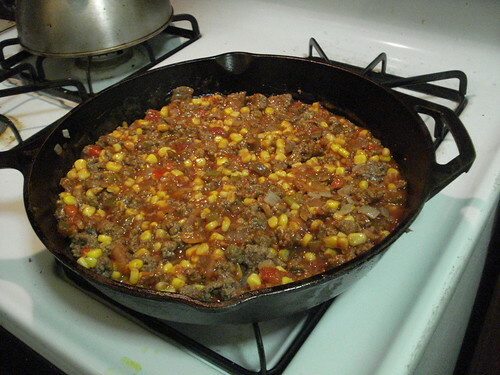 I browned ground beef (once again I used bison) and onions in a skillet, and drained off the excess fat; then I added bottled salsa, Green Giant Mexicorn (canned corn with peppers), tomato sauce, sugar, garlic powder, chili powder and pepper. Yes, I said sugar. 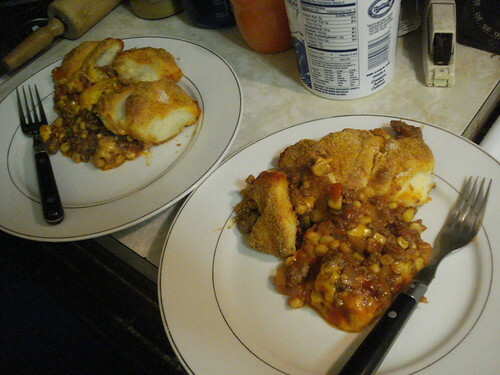 I didn’t approve, but I had vowed to follow the recipe as closely as I could. 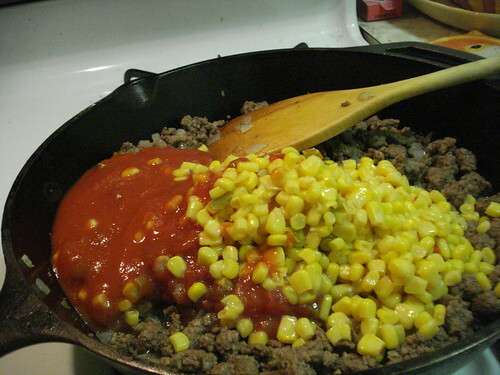 I decided that substituting Tostitos brand salsa for Old El Paso was acceptable, as merely a lateral move; omitting the sugar on moral grounds, while rational and defensible, would not be in the spirit of the project. 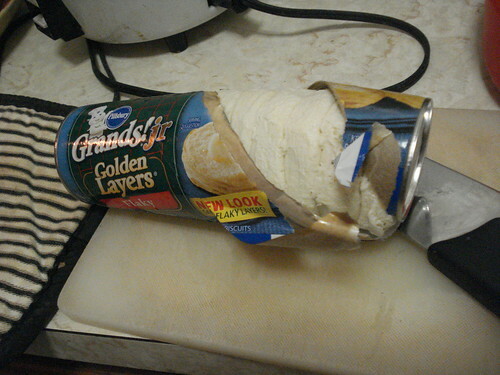 Anyway, I let that simmer for a bit for the liquid to cook off, and in the meantime I preheated the oven and prepared the biscuit topping: I popped open a tube of Hungry Jack biscuits and sliced each of the 10 in half crosswise. And let me tell you, that’s not easy. Oh, it can be done, provided you have a serrated knife, and the ability to let go of the idea that biscuits ought to be round. 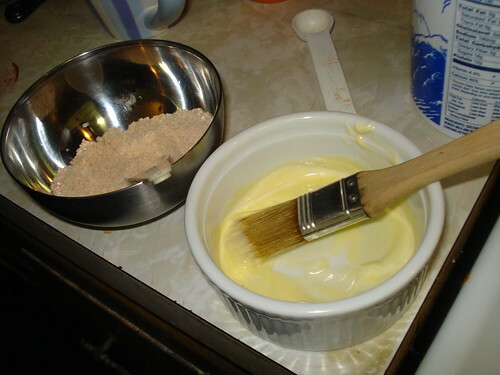 I also blended together some cornmeal, garlic powder and paprika, and melted some margarine. 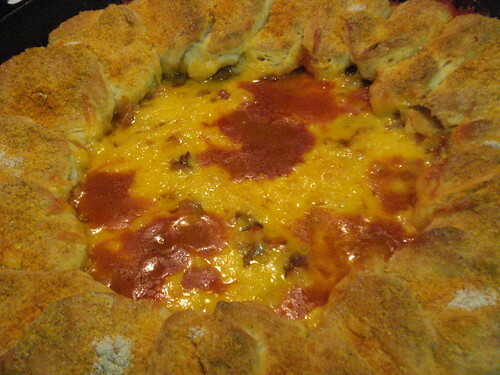 When enough liquid had cooked out of the meat mixture, I arranged the biscuits in a ring around the edge of the pan, overlapping slightly, then brushed them with the margarine and sprinkled on the cornmeal mixture, then topped the meat mixture in the center with shredded cheddar. I slid the skillet into the oven and let it bake for about 20 minutes. I’ll say this for casseroles: They give you time to clean up in the kitchen. Of course, so do lots of baked and roasted items that don’t call for refrigerator biscuits, but I don’t mean to be spiteful. “This is a lot like Hamburger Helper,” my husband said. He didn’t mean it as a compliment. He wasn’t trying to be mean, either; we both felt that the dish wasn’t exactly bad, it just wasn’t actually good. Verdict: Not worth the effort. If I were to try to make an improved version of this I would do several things. I’d add more vegetables, for one thing: actual diced peppers, maybe diced zucchini or yellow squash, plus minced garlic instead of garlic powder. I’d bump up the spices. 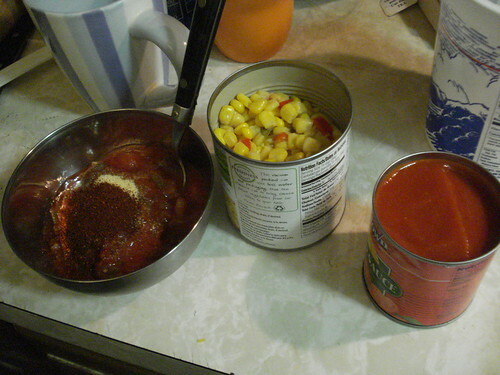 I’d use a homemade salsa and more of it, and replace the 8-ounce can of tomato sauce with a tablespoon of tomato paste to give a rich underlying flavor without overwhelming the other flavors. 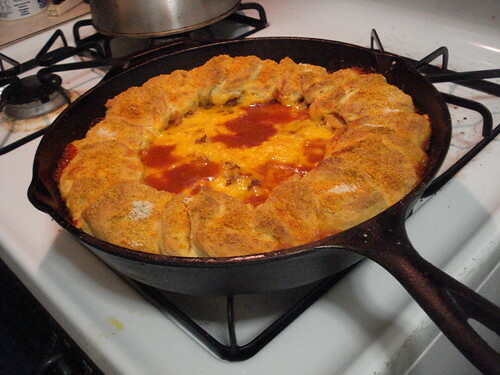 I’d use homemade biscuits, or perhaps polenta rounds. Or I’d just make tacos. I admire your fortitude. I assume you did not save the leftovers. Huh. Not appealing. 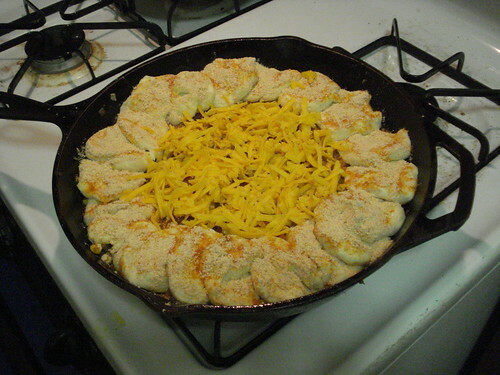 But SO the sort of thing that would have showed up at a Pot-luck when I was growing up.